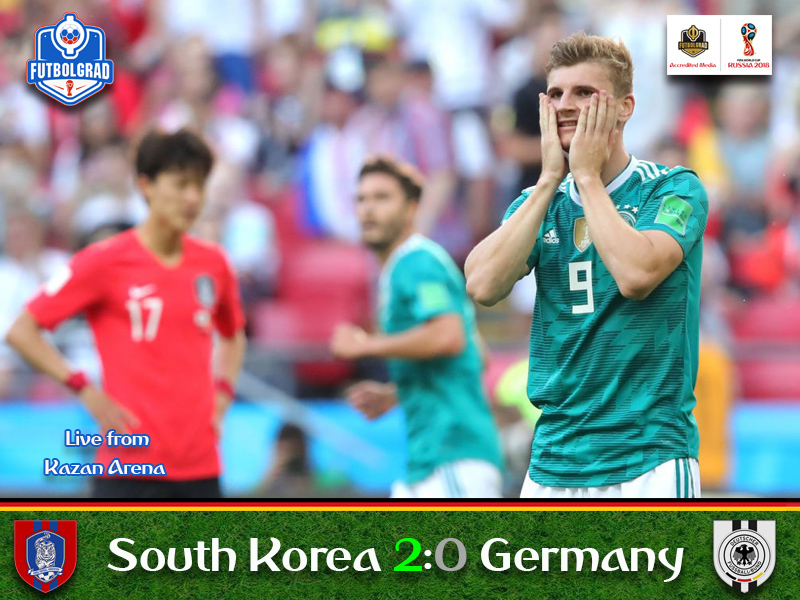 South Korea v Germany ended with a major surprise as die Mannschaft were eliminated from the World Cup after a lacklustre performance at the group stage. Germany fail to make it out of the group stage for the first time in history. South Korea score two late goals to add to the misery. For the third time in a row a defending world champion cannot make it out of the group stage. Joachim Löw once again rotated his side following Germany’s last-minute victory against Sweden. Sami Khedira and Mesut Özil were back in the starting eleven. Niklas Süle came in for Antonio Rüdiger, and Mats Hummels replaced the suspended Jérôme Boateng. The big surprise, however, was Leon Goretzka the future Bayern München midfielder came in his future Munich teammate Thomas Müller, who had a disappointing start to the tournament. It was a somewhat conservative start by die Mannschaft, however. Liable to counters in the first two matches of the tournament Germany sat deeper and tried to control the game by playing short passes looking for an opening in tight Korean defence without committing too many men forward. Nonetheless, South Korea had the first chance of the match in the 20th minute. Sami Khedira gave a free-kick away 30-yards from the goal. Normally, this would have been a less than ideal distance to shoot from but Jung Wooyoung went for it anyways, and the shot should have been an easy catch, but Manuel Neuer managed to spill the ball and only a quick reflex by the goalkeeper prevented Heung-Min Son from scoring the opener. The chance by Korea brought in a period in which Germany appeared somewhat nervous. The passes were no longer crisp, and the movement up front lacked purpose. Hence, although Germany controlled the match, they did not have a look at goal until the 39th minute when Timo Werner broke into the area and had his shot deflected by a Korean defender. The following corner then produced the next chance with Mats Hummels, wide open in the six-yard box being stopped by a wild dive from goalkeeper Jo Hyeonwoo. It was Germany’s only significant action in front of South Korea’s goal in the first half as die Mannschaft struggled to gain dominance over the match. In the 48th minute, Germany finally created their first big chance of the match. Left with plenty of space on the right Joshua Kimmich was able to run into the box and his cross found a wide open Goretzka whose header, however, was brilliantly stopped by goalkeeper Jo. Germany kept coming in the 51st minute a cross found a wide open Werner, his shot from ten yards zipped past the goal, however. At this point, Germany’s World Cup campaign was hanging in the balance as Sweden had taken the lead in the parallel match. All of a sudden, Germany needed goals, and Bundestrainer Joachim Löw reacted taking of Khedira for forward Mario Gomez in the 58th minute and bringing on Thomas Müller for Goretzka in the 63rd minute. Germany needed goals but could not find the target in the 64th minute, Werner missed the goal once again with a shot just to the left of Jo’s goal. In turn, the change of formation also gave plenty of room for Korea, who were now swarming forward whenever Germany lost the ball in attacking third. Nonetheless, it was once again Germany with the most significant chance with Gomez coming to a clear header in the 69th minute that was once again, played to centric and an easy catch for Jo. Once again time was ticking against die Mannschaft, and with Germany going on an all-out attack Korea had the room to counter. Son almost brought his team ahead with a great shot from the edge of the penalty box in the 79th minute that just about missed Neuer’s goal. The minutes were ticking, like against Sweden Germany did not manage to break through. They lacked creativity and perhaps the will to take apart a limited Korea side. With five minutes to go the only thing that was in Germany’s favour was the score in the parallel match as Sweden were romping to 3-0 victory, which meant that one goal would have been enough for die Mannschaft. Germany had chances Hummels missed a header (87′), Kroos saw a shot from 20-yards saved (88′). To make matters worse, Korea scored the game-winning goal in the 90 minute when Youngwon Kim was left wide open in the six-yard box after the corner kick. At first, the goal was chalked off for offside, but replays showed that the ball had come from Kroos and the goal was allowed after the review. With six minutes added on Germany threw everything forward including goalkeeper Neuer and as a result, Son was able to score a second for South Korea on a breakaway. For Germany, this means that the tournament is over and that there will be no more World Cup Anthems played for die Mannschaft. Goalkeeper Hyeonwoo Jo was excellent against Germany. 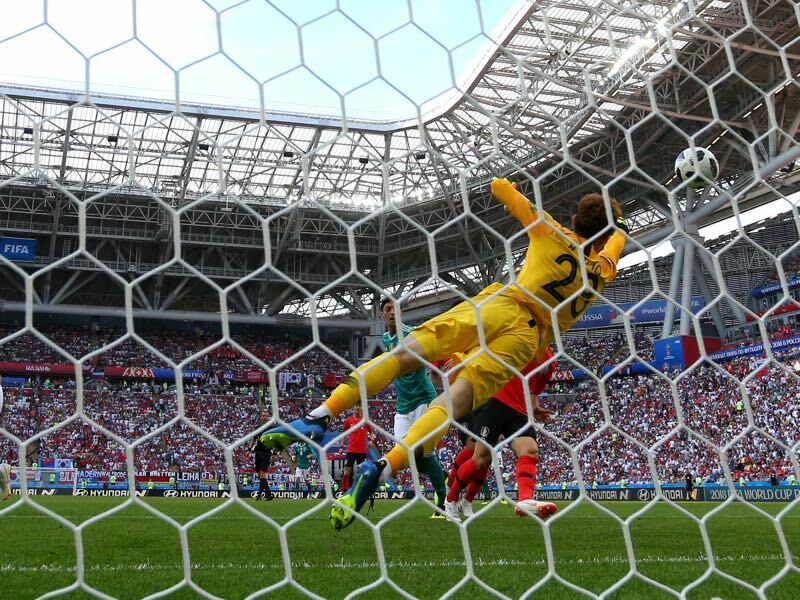 The keeper made six key saves to keep his side in the match at a time when Germany were pressing for the winner and, as a result, it was the keeper who laid the foundation for a historic win for Korea. The trend continues. For the third time in a row, a defending world champion will go out at the group stage. Furthermore, no team that won the Confederation Cup has followed up a World Cup winning performance. That last point, in particular, is on head coach Löw, who failed to integrate the 2017 generation and the established side into fighting unite. After the 2000 master plan Germany once again need to take a long, and hard, look at their development program and find a new plan to dominate world football once again. This is only the second time that Germany have been eliminated from the First Round at the World Cup having last done so in 1938. Four of the last five reigning World Cup winners have been eliminated after the group stages (France 2002, Italy 2010, Spain 2014 and Germany 2018) – only Brazil reached the knock-out stages in 2006. Germany lose their first ever competitive match against a side from Asia. Has Bayern’s six year dominance helped to stifle German football?